In this article the properties of the CartesianCustomLineAnnotation are described. ClipToPlotArea (bool): Gets or sets a value indicating whether the annotation will be clipped to the bounds of the plot area. Label (string): Gets or sets the label of the annotation. Stroke (DoubleCollection): Gets or sets the Brush that specifies how the shape outline is painted. StrokeThickness (double): Gets or sets the width of the shape stroke outline. StrokeDashArray (DoubleCollection): Gets or sets a collection of double values that indicates the pattern of dashes and gaps that is used to outline stroked series. HorizontalAxis (CartesianAxis): Gets or sets the horizontal axis that the annotation is associated with. If no axis is specified, the annotation will automatically use the chart's primary horizontal axis. VerticalAxis (CartesianAxis): Gets or sets the vertical axis that the annotation is associated with. If no axis is specified, the annotation will automatically use the chart's primary vertical axis. HorizontalFrom (object): Gets or sets the start horizontal coordinate of the annotation. HorizontalTo (object): Gets or sets the end horizontal coordinate of the annotation. VerticalFrom (object): Gets or sets the start vertical coordinate of the annotation. VerticalTo (object): Gets or sets the end vertical coordinate of the annotation. 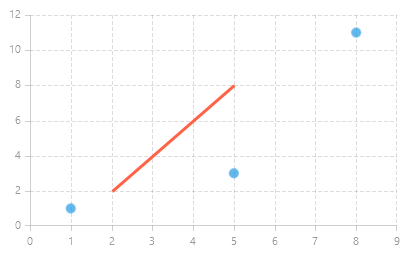 This example demonstrates how to add CartesianCustomLineAnnotation to a RadCartesianChart.